Mazda is known for making driver’s cars; cars that people with a passion for driving can appreciate. Whether it’s the subcompact Mazda2, the legendary Miata, or even the Mazda5 van, just about everything Mazda makes has a bit of that “zoom-zoom” the company has become known for. So when Mazda announced it was introducing a new compact crossover, I assumed it’d have a hint of driving enthusiasm built in. I was right. 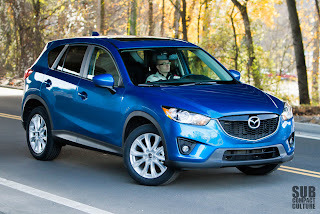 The Mazda CX-5 is a five-passenger crossover that has a great chassis, so it’s fun to drive in the corners, and has the company’s SKYACTIV engine technology, so it gets respectable fuel economy, too. Plus, it’s very practical. Sounds like a good recipe to me. It’s like a sporty vehicle that’s big on utility. Oh, I don’t know … maybe an SUV? I mean, this thing is the literal definition of a sport utility vehicle. But that's OK, we’ll continue to call it a crossover. Back to the “sport” part: In my opinion, the best part about this vehicle is its sporting chassis. 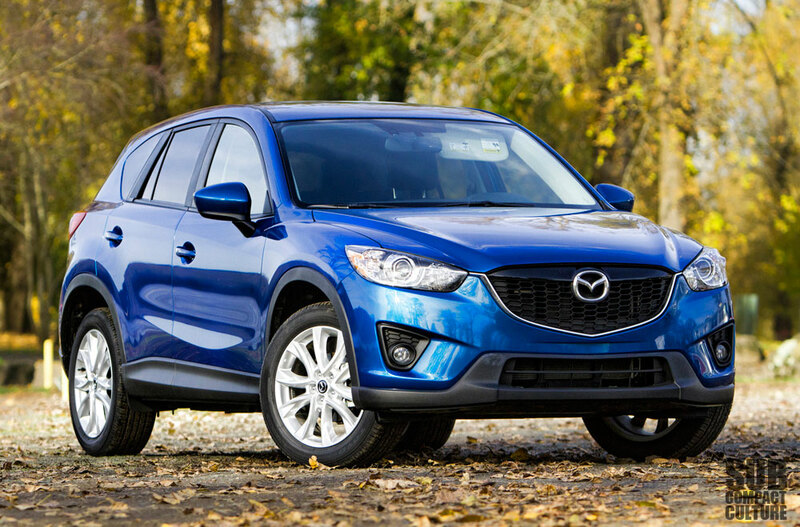 The CX-5 rides firmly but is impressively nimble. The CX-5’s ride is a bit stiffer than say, the Subaru Forester we own, or the Nissan Rogue, for example. However, it excels in the twisties, much like other Mazda products. Body roll is minimal, steering is quick and well weighted, and handling is responsive. You can actually throw a CX-5 into the corners and enjoy it. Our AWD Ground Touring model came with big 19-inch wheels and 225/55/19 tires. 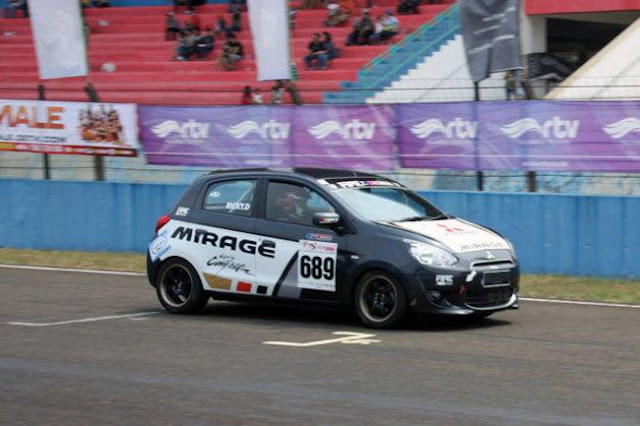 Disc brakes adorn each corner and front and rear anti-swaybars aid in the cornering prowess. 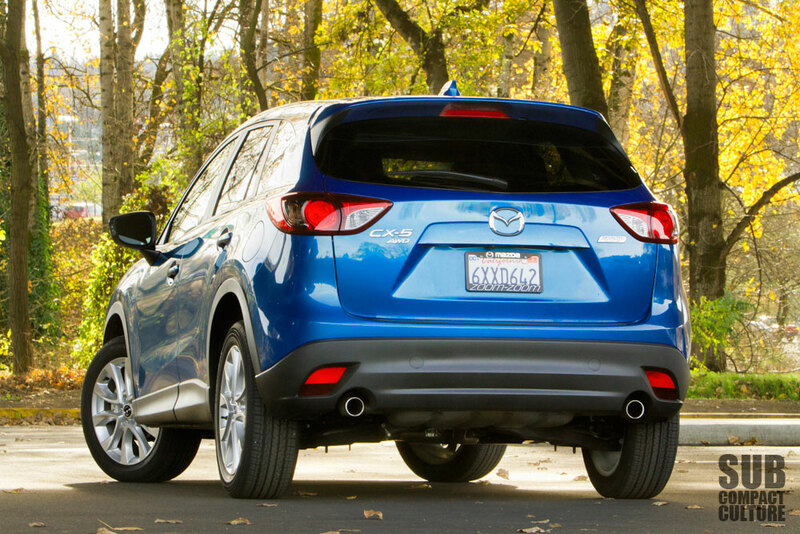 This Mazda CUV drives much more like a sporty wagon than most crossover vehicles. Plus the AWD adds grip on both dry pavement and in foul weather. While the suspension and chassis are very willing to scoot, the engine could use a few more ponies to compliment it. With only 155 horsepower and 150 ft./lbs. of torque, the CX-5 isn’t a rocketship. In fact, it’s a bit pokey, to be frank. Power is just adequate and doesn’t match the chassis’ sporting feel. Our AWD model was equipped with the six-speed automatic transmission, which functions quite well and had manual shifting capability. Regardless, it simply isn’t a giddy-up kind of feel. But, what it lacks in power it makes up for in fuel economy. Rated at 25 city and 31 highway, this CUV is frugal at the pump, especially for its interior size. I averaged 26.1 MPG during the week I had it, and that was mainly city driving. Not bad. Mazda recently announce a larger, more powerful 2.5-liter engine will be available for 2014. Leather-clad seats, easy-to-use control, and great navigation round out very good interior. The CX-5 is plenty practical with room for five people and a good amount of cargo space. Our Grand Touring model was trimmed with leather and had a great mix of luxury and sport. In fact, there were a few tech features that really stood out. First of was the blind spot detection, which works very well. If a vehicle appears in your blind spots, an icon on the outside mirror will illuminate (either side). It will also sound an alarm if you put your blinker on and there’s a car in that spot. Our CX-5 had a user-friendly navigation system that we found to work very well, thanks a great display and easy inputting. Other notable interior bits include the power moonroof, heated seats, automatic climate control, and an above average stereo with Bluetooth connectivity. 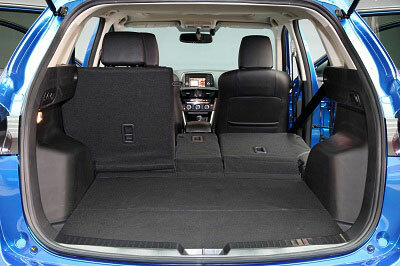 Fold the seats down and you’ll be rewarded with a cavernous interior. In fact the rear seats are pretty trick. Pull one of the levers in the cargo hold, and either the left, right, or just the center section will fold down allowing for great versatility. 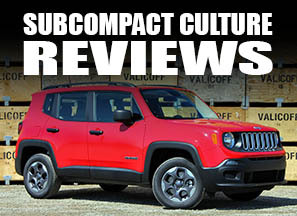 Finally, the exterior is one of the most attractive new CUVs on the market in our opinion. It’s not dowdy, it’s not outlandish. Rather, it’s a great blend of sporty stance, nice lines, and clean looks. We really dig it. Those big 19” wheels look great, but even with the entry level’s 17s, the vehicle looks very attractive. Our loaded test model had a sticker price of $31,005 including $795 in destination. We feel this is on par with other vehicles in its segment. If you don’t want the fully loaded package, an AWD CX-5 Sport goes for $23,645. If you don’t need AWD, the front-drive model is even less. Plus, for you fringe lunatics who want a manual transmission (like myself), you can get a FWD CX-5 Sport with a manual transmission. 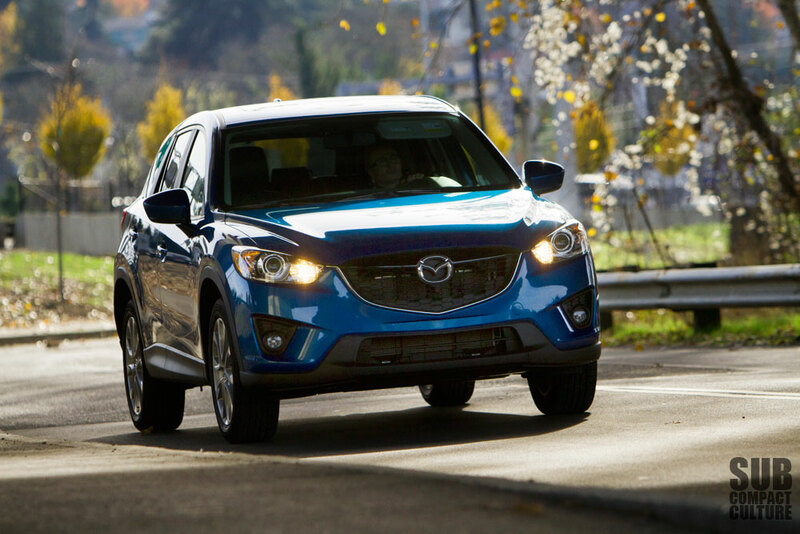 The CX-5 handles like a sports sedan, gobbles up cargo like an SUV, and gets the fuel economy of a compact sedan. It isn’t the fastest, but it’s fun to drive, frugal, and fairly priced. Plus we think it looks good, too. Perhaps this should indeed be called a sport-utility vehicle as it truly possesses both sport and utility.